Since 2008, The Green Tones from the University of North Texas have been making a statement in the North Texas music scene. The group has become one of the most prominent contemporary a cappella groups in Texas, and exhibits a certain style and talent that only comes about from a group of people who are dedicated not only to the music, but to each other. We took some time to get to know the coed group from the Lone Star State and learn a little bit more about their beginnings and their recent successes. COLLEGE ACA: Can you tell me about the group's founding? When did the group begin? Any specific influences, past or present that you all can point to that inspire(d) your style? The UNT Green Tones were founded on October 7th, 2008 by a group of friends who had a passion for music and a cappella. As far as the group's style goes, we are influenced by artists all over the musical spectrum, never overlooking a potential song to be arranged because it doesn't fit a specific "genre." Any special significance behind your group's name? The University of North Texas' school color is Green. And as students of UNT, we are known to be a part of the "Mean Green Nation." 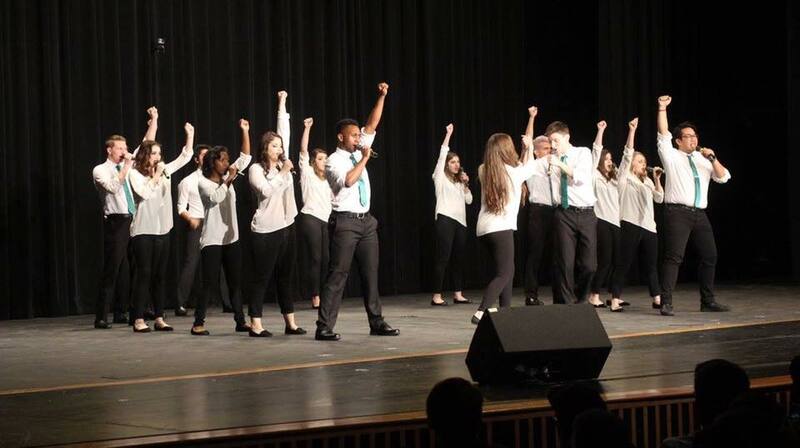 So, naturally, the Green Tones was a perfect fit for the school's only co-ed, contemporary a cappella group. Denton, TX is such an eclectic music scene that draws on diverse artists and big events from Jazz festivals to 35 Denton. How do you see The Green Tones sound fitting into not only campus life, but the overall music scene? The Green Tones have worked tirelessly over the course of the group's existence to not only be a staple on campus, but also in Denton and the surrounding areas. What makes this group stand out to most, is the fact that it doesn't fit the cookie-cutter image of a music group you would expect to see performing in Denton. We are a student-run group, so the only guidelines we follow are the ones we set for ourselves. It is this freedom to express our love for music using whichever methods we choose that has set us apart from others and allowed us to leave our own unique mark on Denton's diverse music scene. Currently, what are the top 3 shows that the group is streaming on Netflix? The Green Tones are currently streaming Stranger Things, New Girl and The Office. What are some of the activities the group likes to get involved in when they aren't rehearsing or performing? What do you all do for fun? The Green Tones is a big, music-loving family made up of members who genuinely just appreciate and respect each other. Our favorite things to do as a group are traveling and exploring new cities together, breaking out in unapologetic song and dance routines at parties and hanging out at our favorite local food stops. But regardless of the activity, as long as we're together, we're always having a great time. This past school year you all competed in the first ever Southwest region of the ICCAs and advanced to the semifinals. Is there anything that you all took away from that experience as a whole that you might keep in mind for the upcoming school year? Something the group really focused on last year that worked well for us during our time competing in ICCA was the overall comradery of the group. Before anything else, this group was meant to be a safe-haven for people with an equal love for music and each other to come together and do what they love - sing! So in order to keep that spirit alive, we focused more on the fun and the amazing opportunity the competition gave us to grow as a family as opposed to the stress such an important and esteemed competition can sometimes bring on. That being said, last year's competition gave us something to fight for and enabled us to hone in on what makes us unique, boosting the group's confidence for this year. We are so excited to be returning to the competition with that newly established confidence and are ready to reveal to the A Cappella world the improved GT sound. Do you have any crazy/funny/interesting stories from group road trips, performances, rehearsals, etc.? There are always crazy stories from our performances, some of our favorites being from the ICCA competition. We especially love hearing from high school-aged students who are inspired to look into UNT for their college education after hearing the Green Tones perform. It's so rewarding to know there are others who are inspired by the work we are lucky enough to do every day. Pre-performance rituals include but are not limited to warm-ups (of course), screaming the Green Tones' group chant, saying a quick group-prayer and exchanging words of encouragement before leaving it all on the stage. What one song does most of the group love, but would never, ever perform during a live performance? Anything else you'd like for our audience to know about the group? Any big plans for the coming school year? We are working towards strengthening our online presence and urge everyone to follow us on Instagram and Twitter (@UNTGreenTones) and like the UNT Green Tones on Facebook for the latest aca-news. Look out for new videos and our end-of-semester concert dates TBA soon! Be sure to follow The Green Tones on Facebook, Twitter, and YouTube.